We all have our favorite scents. For some it's the warm scents of vanilla, for others it's the tropical scents of plumeria and coconut. For me, I love the energizing and uplifting citrus scents like lemon, lime, orange, and grapefruit. If you caught my post a few months ago, I introduced Citrus Clear's products. I've been using the products since and they have helped moisturize my dry, sensitive skin, and at the same time satisfy my love of citrus scents that give me energy and make me happy! 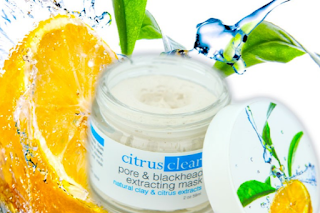 Citrus Clear has a unique holistic approach using citrus ingredients to provide premium, concentrated skin care. We are an evolving company that will continue to focus on ensuring our products are naturally based, eco-friendly, and, sustainable. This is our way of life. We believe in awareness of others, our environment, and, the collective nature of human beings. I love that the products are organic, chemical-free, not tested on animals, and made in the USA! Contains pure plant ingredients, herbs, and two types of natural earth clays which penetrate deep into pores and extract dirt and blackheads. When combined with citrus oils and extracts, the clay and citrus come together to create a potent pore shrinking and blackhead removal mask. To use, you apply the mask to a damp face, and allow the mask to dry for 4-8 minutes. It goes on smooth and works right away. The tingling sensation let you know it's doing the job as soon as you put it on! I really enjoy the tingling feeling. It's almost like little fingers massaging your face. As the clay in the mask dries, it also absorbs dirt, dead skin cells and blackheads from your pores. The mask washes off easily, removing all the dirt and bacteria that has been absorbed into the mask. The vitamins and minerals in this mask are also designed to tighten pores and create a smoother, even complexion. My skin looks clean and re-energized after this mask. I totally love it! The organic ingredients in this moisturizer make your skin feel soft and refreshed. I like it's light texture and it's ability to keep my dry skin moisturized without feeling heavy or greasy. The formula contains soothing botanicals, citrus ingredients, and powerful vitamins designed to gently balance facial skin tone. I have to admit Citrus Clear products are one of #LysasFavoriteThings and I know you will enjoy them also! Although I received sample products from Citrus Clear in exchange for this blog post, all opinions are mine. Hey Four Eyes! This is For YOU!